I have found an item belonging to a member of the crew of HMS Argus. The only information I have on him is that he was born on 6th November 1919 and his mother or he seem to have lived in Diss, Norfolk. Would you be able to help me reunite this item (not precious, only sentimental value) with descendents or close family? I am a retired mariner whose uncle died on H.M.S. Somali when she eventually sank in 1942 - QP14. I already had his posthumous medals and then applied as next-of-kin for his Arctic Emblem, then his Arctic Star, both of which were awarded me by the MoD. With my interest in the Arctic Convoys, and the support of Tim Lewin (son of Admiral Lord Lewin who had been involved in towing my uncle's torpedoed ship), I was able to help a friend's father apply for and receive both his Arctic Star from the MoD, and the Ushakov medal through the Russian Embassy. Sadly, he died a few months later, however, he was awarded these medals for service on H.M.S. ARGUS when she delivered those Hurricanes to Russia. The ‘ARGUS was not recorded as part of that first convoy - Operation Dervish - and does not appear in Ruegg & Hague's book ‘Convoys to Russia' [isbn 0 905617 66 5]. This is because she sailed independent of that convoy, however, there is no question of her being associated with Operation Dervish, and is seen in that film ‘Hurricanes to Murmansk'. My friend's father was then an Engineroom Artificer. I hope this will encourage Terry Lippmann to re-apply for his father's Arctic Star, and if still alive, his Ushakov gallantry medal. My father, Frank Hippman, took part in Operation Dervish sending Hurricanes to the Russians. He was in the RAF and assembled the Hurricanes prior to them being flown off. I too have applied for the Arctic Star, but was rejected as there was no record of him. I have his service record and there is no mention, however, this maybe because once the aircraft had all flown off he returned with the ship rather than go on to Russia with the rest of the RAF personnel. His total time on board was less than a month. Could anyone help prove he was on the ship at the time? There is a grave of a J. Roberts, a stoker on board HMS Argus who was killed In 1940 at the age of 22...the grave is in Sandy, Bedfordshire. I am interested to find out about him. The ship survived the war and I wonder why he didn't. My father was on HMS ARGUS in WWII 1939 to 1945. He was leading stoker JAMES FERGUSON. He never talked about the war only when my Brother and me got him drunk at new year they were some stores. Even my mother never herd them before. Malta, Archangel, Murmansk. He was shot in both ankles and I remember as a child putting my finger in the holes. Would like to find out more. He said there were some famous people on board that he got to know. He told us one time he was pals with H. Samuel's son, when he was killed he went to see his father He even was offered a job after the war with Samuel's. Many stores Russ Conway served as well. My dad served on the ARGUS as stoker 2nd class he never spoke of his war experiences doubt now that there is anyone who could detail the experience, but his name was WALTER FREDERICK CANT. He was there Jan/Sept 1941. Can anyone tell me how to get crew lists. My father Peter Langford was on the Argus, and I have been unable to get crew list confirmation, mainly because he was in the RAF and seconded to the ship operating the RADAR. I too have applied for an Arctic Medal for him, but without confirmation on the crew list this is difficult. I am researching A flying officer Herbert Parker of the Royal Air Force who served on HMS Argos from 22nd march 1921 length of time aboard unknown. He would I believe have been involved with the ground maintenance etc.. activities. I would be interested if you or your readers might be able to shed some light on his time on Argus. Any info would be helpful. My Uncle was commander on the Argus during the WWII, his name was Reginald Woodriffe, I know he was involved in the first supply of fighter aircraft to Russia and subsequent convoys to Russia. I would be interested in hearing if anybody remembers him and maybe any photos of him. I have applied for the Arctic Star, but don't know if I will be successful. I would like to inform you that I have received the "Artic Star" medal. moved too fast and the Austers were delivered to France guided by a Walrus. I managed to get her crew list for 1944 when she paid off and that's included. Whilst rummaging through some stuff I found her ship covers/drawings. James Ferguson, my dad, was on the Argus 1939 to 1944 Leading Stoker. He was pals with H. Samuels the jeweler son who also served and was killed. Dad went to Samuel's father to tell him what happened. Also another friend was Russ Conway piano player who also served on the Argus. Good story the Germans put out that they had sunk the Argus, dad did not know this so when he came home on leave he met an old woman who knew him. She said Jimmy run home to your mother they think your dead. We had that newspaper telling of the Argus being sunk for years don't know what happened to it, must have been lost in one of the flittings we did. He had a lot of stories, but he did not talk much about the war. Only in later years my brother and I would get him on the whisky. One other thing he used to go on about a Captain Phillips, don't know if he was the captain of the Argus or not, anyway dad is dead. Suppose most are now. Never seen any photos of the crew or anything. Been to Malta they have a few things including photos of the Argus. My father, Robert Nicholas Lomas, died in 2001 aged 77 after a long and fulfilling life. He was in the Navy and served during WW II, on HMS Argus I think. Putting together a few snippets of info I think he served from 40 to 42 before being posted elsewhere. Does anybody remember him or could point me towards more information on his time in the RN? I am currently researching my family tree, and I have come across a distant relative who served on the HMS Argus, he died on November 11th 1942 on board the ship, he was called Joseph Bird. I was wondering if anyone had heard of him or knew anything of him? Megan was inquiring about Joseph Bird who served on HMS Argus and was killed on board on November 11th 1942. Joseph was my husbands older brother and if Megan would like to get back to us, we may be able to help with further information. My husband and I found your web site really interesting. Joseph Bird was born in 1922; he is buried in the UK Commonwealth War Graves, Lee-On-The-Solent; his father was also called Joseph (1899-1989); his mother was Annie Burns (1901-1965). If you would like further information regarding the relatives of Joseph Bird (junior) then you can contact me via the webmaster. My late father, John Donald Wingfield, served on H.M.S. Argus from 14 October 1939 until 11 July 1942. Does anyone remember him. He was in the R.N.V.R. I believe he was a gunner. I am trying to unravel the life of my Grandfather. His name is J or possibly M Spencer Wetmore. In 1921 (24/08/21) he was apparently on board the H.M.S. Argus. He flew Sopwith Camels. This is the only information I have about him. I saw you had a forum where people posted in relation to family and was wondering if this could be added. My father, Albert Webb, served in HMS ARGUS as a PO Air Fitter from 1942-1944 and I have a number of photographs taken during his time on board including several of groups of crew members, a christening on board, a burial at sea, the ship's band and a variety of aircraft shots. I noted that Mr. Kevin Brickwood (Message #4) mentioned that his relative was a band Sgt. RM, he may appear in the band photos. My dad, Frederick Tarbin, was a telegraphist on the Argus in 1940 or 41. The Argus was going from Greenock to Russia (Murmansk or Archangel). From age 14 he'd done Boys Service and 13 years Man's Service and had got out of the Navy in 1934, the year after I was was born in Gibraltar and we returned to London. He was on reserve and got called up in 1938. My Dad got my Mum and little brother and me to move up to Greenock to get away from the bombing in London. I could see the Clyde from our flat and would run and tell my Mum when the Argus came in. We had no sooner moved there though when the Germans started bombing Greenock and Glasgow docks, and I believe the Argus and my Dad moved to the Med so we moved back to N. London. My mum said she'd rather be bombed in our own house than in Scotland! I hope this fills in a little of history of the Argus and one of the seamen on her. My Dad always spoke affectionately of the old Ditty Box when I was a kid. He was a '10 Pound Pom" in 1972 and passed away in Australia in 1987. 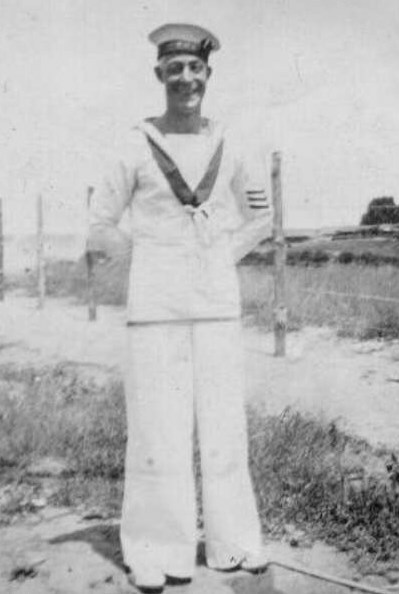 Frederick Tarbin seen in 1942. My father, Walter Frederick Pegg, served on the Argus at the end of WWI. He was an aircraft fitter, repairing damaged airframes. He stayed on for a few years after the war. He was probably amongst the original crew. We lived in Barnsley, Yorkshire. When he served on the Argus I think he still lived in Hull, where his family came from. As a child (I was born in 1940) I remember a large framed picture of the ship in our home. During WWII he used his great wood working skills to repair wooden aircraft that were still in service at various R.A.F. bases. I remember him explaining to me that the Argus was part of the navy--called the Fleet Air Arm. Later, aircraft carriers became part the R.A.F. Is this correct? He made lots of toys and pieces of furniture from bits of wood from damaged aircraft in his spare time in the war. After the war he worked as an insurance agent in Barnsley. He died in 1968. My father-in-law, Horace Randall, served on HMS Argus. I'm trying to locate pictures of crew members that just might have him identified. Can you direct me to those web sites that might help. My father Leslie driver was a coder on argus 1939- 45. I have many photos, a tartan edged silk handkerchief, a blue silk handkerchief with argus on, and the copper plate that was 1 of 2 that was either side of the bridge, depicting the argus pheasant, that my dad took off at the end of the war when he was removing the radio gear. He was on Malta convoys, got the Malta medal and the Russian convoy medal. I wonder if anyone remembers him, he was a fantastic pianist and took church service and also he was sent to do ensa parties when up on the clyde. My memory is fading, but I think I served with Les Driver on Argus. I believe he was from the Scunthorpe area. He joined us with another Scunthorpe coder Bob Stephenson. Les was pre-war connected with a local dance band but I think he played the xylophone. Bob Stephenson lived in Scunthorpe (possibly still does) about 10 years ago but he is no longer listed in the phone book. He said he eventually progressed to Coder instructor. He did not know Les's whereabouts but thought he was involved in the taxi business. "He indeed was the same Les Driver, from Scunthorpe, he was a pianist and did have a danceband------- the Majestic Melody Makers, and there signature tune was the robins return. My dad after the war went back to his job as blast furnace Forman at Appleby Frodingham Steel Works at Scunthorpe, until buying a grocers shop in Dewsbury, then a hotel in Southport, lived in Skegness until he died. My grandfather-in-law served on the HMS Argus in WWII and I was wondering if you would have any photos or mention of him in any documents. We are planning a "milestone" birthday party for him and would love if you could point me to where I could find information/photos of the crew. He was an enlisted man, not an officer and his name is Reg Sellman. Thanks so much and great website. My Dad served on the Argus in WW2. He was a stoker. I would love to find any photos of him on the ship. His name was Edward (Ted) Farrell. what he would have been doing I would be interested to know. Charity, but why were RAF staff on the ship? He never spoke about any of his RAF career and wonder what he was doing on the ship. He also served on the Norfolk. He was trained as a wireless and radio mechanic and did codes and ciphers and radar. Do you know if there is a HMS Argus association?? I found your web site while searching for some information on the Aircraft Carrier Argus and thought you might be a "starting point". I have a photo of my late father - Ronald Wagstaff (died 22nd April 1975) playing cricket and Mum (died 4th Sept 2004) has written on the back - Ronald Wagstaff 1943, Arbroath Scotland, opening bat 43 runs not out against HMS Ambrose. He was on aircraft carrier Argus. He was a leading aircraftsman at the time (as far as I know) and I do have his service number if that is any help. I was wondering if you have any photos of the crew or personnel aboard the Argus around that time as I know very little about Dad's military service and would dearly love to find out "something" ?? My parents, plus myself and a younger sister, arrived in Australia in July 1948, so I have found it hard to find out where to search for information. You may be able to steer me the right direction. Hope to hear from you soon, thanks for listening. Hello, my name is Kevin Brickwood, I live in Quesnel British Columbia Canada and my father served on the Argus during the Second World War. My fathers name was Alexander W Brickwood. My father was a Band Sgt and has quite a collection of medals from the war of which he never discussed with me. My father died in 1987 Do you have a crew list from the Argus or have you any information on the ship or its duties during the war. I do know that he served on other ships during the war but not sure which ones. He was with the first wave of marines on Hiroshima and told me of stories associated with it. If you have any information on him please let me know. I have been speaking to an uncle of mine who tells me that my father Tom O'Donoghue was posted to HMS Argus as a signalman. He served on the Russian convoys as well as the Med. Do either of the two gentlemen shown on the Argus message board remember him. Unfortunately my father died in 2003 and he never recounted any of his was time stories to anybody. Sorry, Dave, I'm afraid I don't recall my dad mentioning any particular names. My dad Arthur Holroyd served on HMS Argus as an Able Seaman. He said its nickname was the Ditty Box cos without any superstructure apart from the little deck house it looked like a sailor's tin hat box. He too was in the Mediterranean, was it Force H (?) flying off planes to Malta, and at least one of the Russian convoys. He used to tell me about the time the Ark Royal was torpedoed and described seeing the planes on the deck sliding off as it heeled over. He described one other occasion when the cruiser Sheffield (?) shadowing them in the Med saved their bacon by shooting a Stuka out of the sky as it was about to dive bomb them. I believe his action station was on one of the Oerlikon's. I also remember he said his best mate on board was killed whilst manning his gun at action stations. I know he was always upset if any film showed a burial at sea. On the Russian convoy he said they went far enough north to see the lights of Spitzbergen. He also said it was so cold they spent loads of time on watches chipping off the thick ice that coated everything. I believe he said they flew off Spitfires to Russia. I think after that it was used as training ship and for towing gunnery targets in the Clyde. After that he was sent out to Sri Lanka (Ceylon as was) on guard duty. I've often wondered, why waste an Able Seaman that way but I recently discovered that part of the Far East GCHQ outfit decoding enigma messages etc was based in Ceylon - so perhaps that was why? The only shipmate he contacted after the war was a chap (sorry I don't remember the name) I believe lived on the Yorkshire coast near either Hornsea or Withernsea. My Dad Reginald Arthur Dickinson served upon this ship 1940-43 as the ships butcher and his nickname was Butch. He was a Royal Marine and later joined the military police. He was a machine gunner at action stations and served in Malta and Russian convoys. If anyone has any questions feel free to ask. I can remember your dad very well ,his name I can not place but when you say Butch, yes I can. I joined the ship in nineteen forty one. The mess I was put on was all new starters and he was put in charge, as being a canteen messing ship he was maid cook so he had the job of preparing the meal which went to the galley to be cooked, what lovely cuts of meat we had. We were allowed some money to spend over the month, we always had cash back, this went on for a while, until the other messes complained so he was taken off. He must have been on the pom-pom for action station. I can't remember when he left the ship, I was on it until it was paid off in forty four.